Bits of My Own: Deep Peace is finished! I was beginning to think it would never happen! Actually I finished the stitching last week, but I didn't iron/steam it until this morning. Hopefully I took enough of the volume out of the center of the D with the steam. It seems to lie a bit flatter now. I hope when it is framed, it will not be noticed. First I had to re-stitch the berries with the pink color. 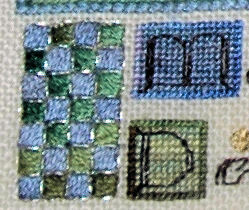 Then I illuminated the vertical and horizontal columns with silver back-stitching. I didn't have a picture that showed the pearl purl around the letter last time. This one shows the completed D.
The letter is over-layed with gold filament as well. I was worried about ironing/steaming the metallic area, so I used as little heat as I could. The purl at the top still looks a little wonky, but I am hoping it will stretch out when it is framed. Next, the gold and silver paillettes were added. They were supposed to be done with French knots, but on occasion I had to take an extra stitch to keep them secure. Phew! I am very glad to have this one finished! Just in time for the hurricane! Hope I will be able to get some Deep Peace and we don't lose any more trees! The winds have really started to howl here! I wanted to post this before we lost power. Hope all of you stay safe from Sandy! Good luck! I hope you that hurricane Sandy doesn't cuase too much damage and that you stay safe. Oh my gosh, what a masterpiece! Just gorgeous! Congratulations! Here's hoping we all stay safe and sound from the hurricane. I want to say the same as Margaret: that's a real masterpiece! Congratulations on finishing it so fast, your needles must have been smoking. Congratulations on the gorgeous finish. CONGRATULATIONS!! It's a beautiful piece and I have enjoyed watching your progress. Congratulations on an absolutely gorgeous finish!!! I've enjoyed watching you progress through this one! This really is amazing, like a proper illuminated manuscript! You should be very proud of yourself for persevering and completing this beautiful work of art. Exactly what we did NOT need ! OMG What a dummy I am!